Despite the fact that this crypto winter continues to cause so much havoc, the popular cryptocurrency exchange Binance, was able to register a total of $446 million in profits in 2018. Chepicap reported in July 2018, that Changpeng Zhao, the CEO of the world’s largest exchange, affirmed that he expected Binance to make a minimum of $500 million in profit in 2018 alone, adding that the possible maximum could result in a cool $1 billion in annual profits. CZ explained that 2018 has been rough on some exchanges as Bitcoin nosedived, losing 80% of its value. Hacking attacks and financial authorities have also had a negative impact on many leading exchanges around the world. Despite ongoing bearish market conditions, Binance was at least able to achieve the first part of CZ's prediction. 'Binance uses 20% of its net profits to buy back BNB and eventually destroy 100 million BNB tokens. Their profit is simply five times the USD equivalent of each burn, if the firm is staying true to its whitepaper commitment', the Block states. 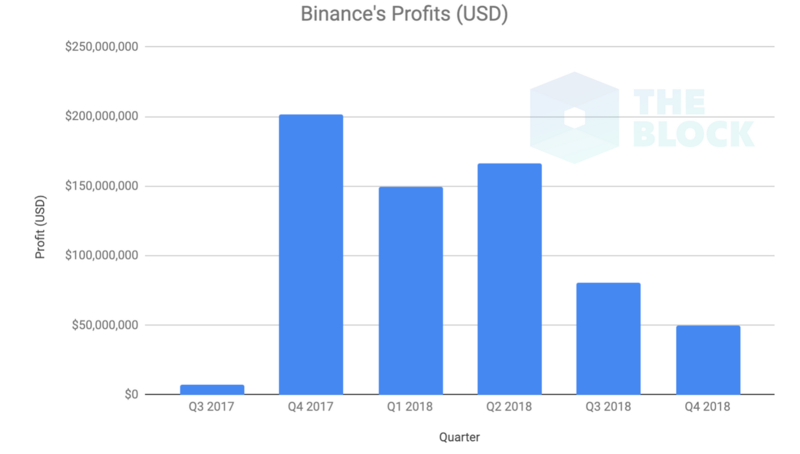 Over the course of 2018, Binance raked in $149.6 million in Q1, $166 million in Q2, $80.9 million in Q3, and then $49.6 million in the painful months of Q4. While these quarterly profits are still massive by any means, they are nothing close to the $201 million in profits earned in Q4 2017. It is safe to say that Binance is a clear leader among exchanges, and it will be most interesting to see how they will continue their success in 2019.